Introducing the world's first game improvement golf cleat. It's the first ever assymetrical cleat system which you customise to suit your game, when combined with the Champ Q-Lok system. In essence, it gives you improved grip, stability and balance when playing a shot for greater power and accuracy. 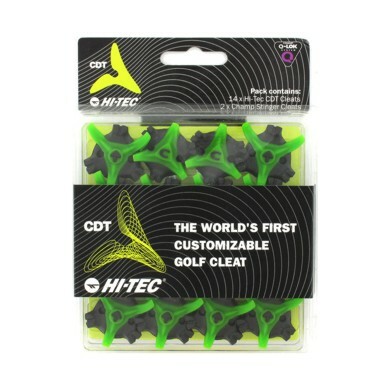 CDT cleats are made from the latest synthetic materials and are 'green-friendly'. So, if you're playing on a harder, more compact green, the cleat pins spread your load over a greater surface area, reducing any potential damage to the green. On the fairway where the grass is longer, the pins move between the blades of grass and sit to the contour of the ground. This means they play a more active role in the shoes' grip.